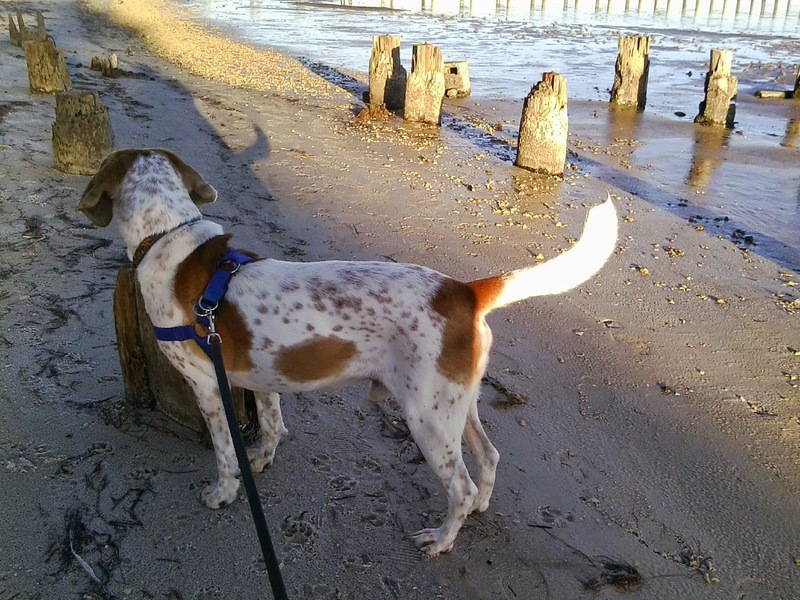 Living in the Florida Panhandle gives new meaning to the dog days of summer, especially with my dog Tidbit by my side as my beach combing mate. 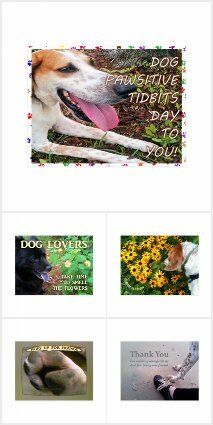 Together we learned how to beat the sweltering heat of hot summer sun, a necessary part of heat stroke prevention for the sake of health and wellness of my dog. It is imperative that dog owners know how to prevent and treat heat stroke in their dogs. We need to know the early signs of heat related stress so we can address the issue immediately. Once our canine companions show signs of heat stress, they are well on their way to heat exhaustion or heat stroke. This can result in serious irreparable damage to the dog, or death. As it is with humans—prevention is the key to health and safety for dogs in the warm of a summer day. Whether you live in a warm climate or it is just plain hot in the summertime wherever you are, or even if you're planning a vacation to Florida, protect the life of the dogs that travel with you. Heat stroke is no joke! Medical Disclaimer: Based on my personal knowledge and experience through dog ownership and advice from my personal vets over decades, the information shared is never meant to replace professional veterinary care! I highly recommend that you contact the vet you have entrusted with your dog's care for medical advice and dog care for this and all health issues related to dogs. The #1 thing to remember is to never leave your house with your dog in tow without toting water too! Whether on foot or in a vehicle, it is imperative that if your dog is with you, then you must carry cool drinking water with you too. This rule should apply in the summertime as well as any other time. Get in the habit of being ready for the unexpected, for the well-being of your canine pal. 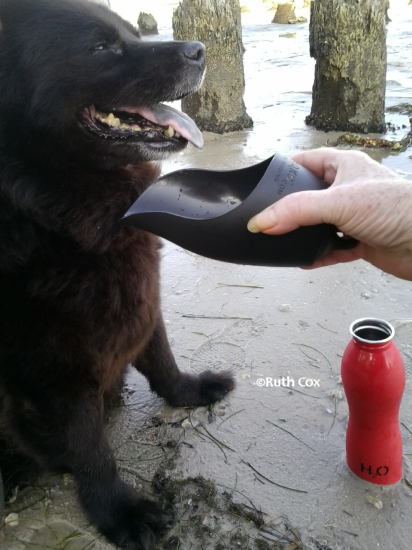 After moving to a hot and humid place near the beach, it quickly became clear that I needed a water bottle and dog bowl to tote with me on our daily travels through the neighborhood and for our long walks on the beach. 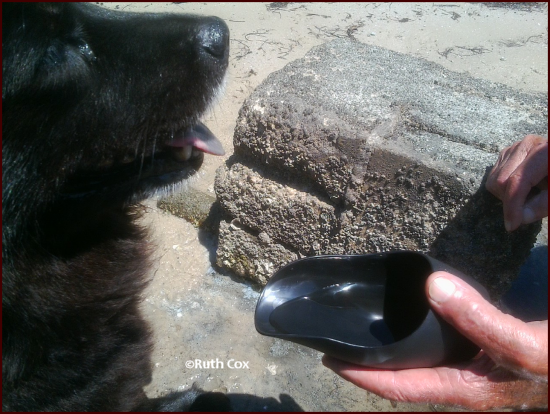 Tidbit was a bit fussy about what she would drink from, insisting on cool but not icy cold drinking water from her stoneware water dish. I didn't want anything cumbersome to carry and I also wanted it as eco-friendly as possible. I searched my favorite store for the something that just might fill the bill for the both of us. I settled on the H2O4K9 ... Tidbit and I could not have been happier with my decision! Never again will I be one to believe that old saying, "You can't teach an old dog a new trick!" 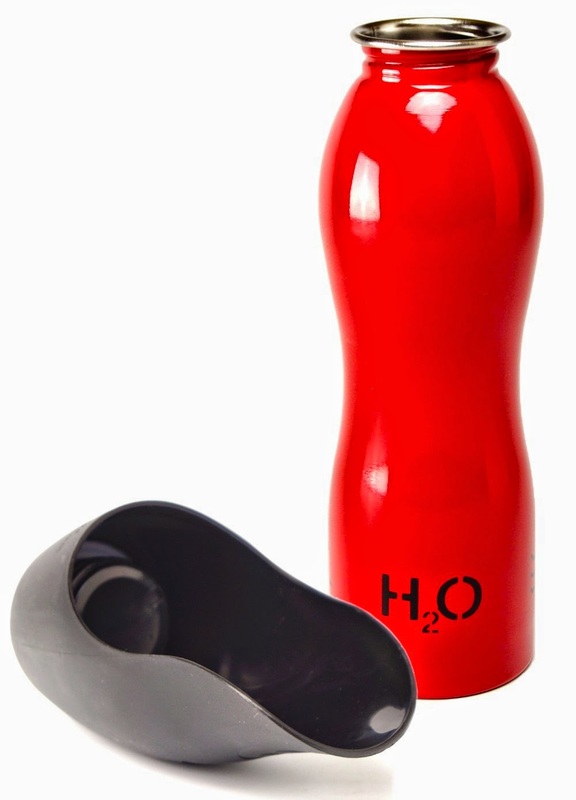 H2O4K9—Don't leave home without it! 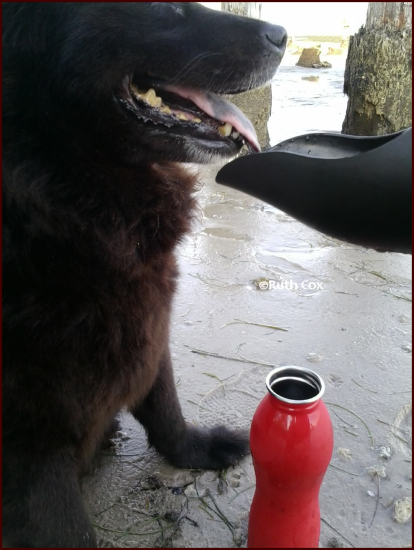 This K-9 thermos and dog dish became the perfect duo for me and my dog! The stainless steel bottle keeps the water cool, but not ice cold, just like she drank it at home. And after a few slops and slurps, my dog figured out how to use her new bowl to satisfy her thirst. The lid (which is the bowl) has a clip loop on it, which is how I currently carry the bottle, clipped on the leash handle. 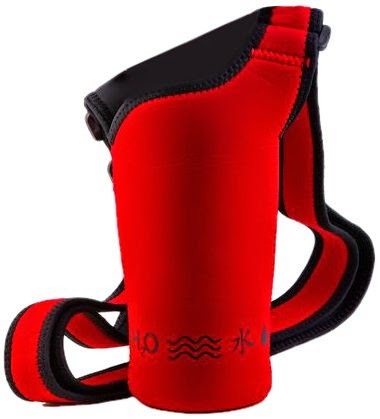 This water bottle holder is the hands-free solution for carrying your dog's H2O4K9. The adjustable bottle carrier also helps keep the water in the stainless steel bottle a bit cooler for a little longer. Stubborn as can be, but my dog learned to drink from her H2O4K9 water bottle and bowl! At first, Tidbit turned away from or ignored the water bowl. Eventually, thirsty Tidbit drank from the water bowl! Dogs with dark fur attract the rays of the hot summer sun, absorbing the heat quickly. Since dogs can not sweat like humans do, this means they get overheated and if we’re not watchful they can suffer from heat-related issues, such as heatstroke. Furthermore, the dogs sunburn, just like you and me! Dogs with lighter coloring and shorter hair, like my dog Valentino, have the disadvantage that with the summertime sun their skin is apt to burn more easily. Yes, dogs do get sunburns and have heat strokes, just like you and me, so watch over them with compassion and caution. 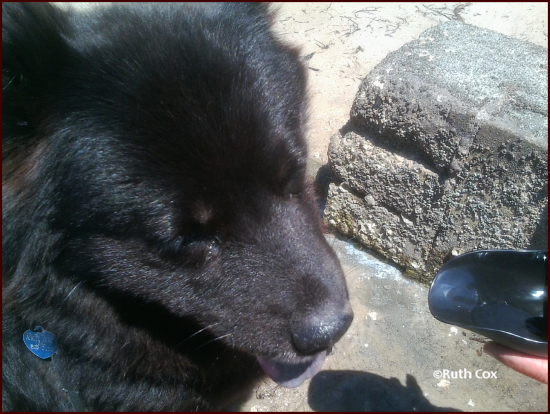 Here are some dog pawsitive tidbits for how to keep dogs cool in the hot summer sun … take heed! An elder dog's body heats up at a quicker pace than young pups. 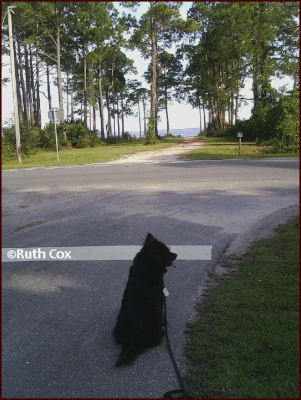 I follow my dog's lead, paying attention to her signals for a stop in the walk! At the same time, I pay close attention, too, in case she herself is going to overdo and then I take the lead. Some dogs don't know when to quit doing what they love and rest and relax instead. I pretty much always knew when Tidbit's energy level was down and she wasn't able to go beach combing with me. A block from the house is the stop sign and crossover to the pathway to the beach. She let me know by coming to a full stop at the road and she wouldn't budge! Reminder: High body temperatures are not good for dogs and could be a sure sign of a heat stroke, or other medical issue, so monitor this carefully. Water helps heat evaporate. Cool puppies and dogs before their temperature rises. 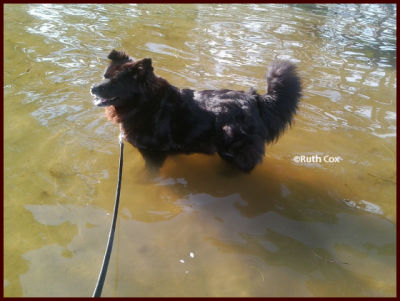 When beach walking with Tidbit, I made sure she waded up to her belly in water occasionally, to help keep her cool. If neighborhood walking and it is hot outdoors, I may spray the dog just a bit with the water hose. Or, better yet, I've been known to run through a neighbor's sprinklers while walking my dogs! Take time to stop and smell the flowers along your way! This is a good way to give a dog a break for rest, but of course a shady spot works best. Rest time also gives me a moment to pet the dog and check their body heat. If the fur is too warm it is time to cool off, drink a bit of water, and head home. 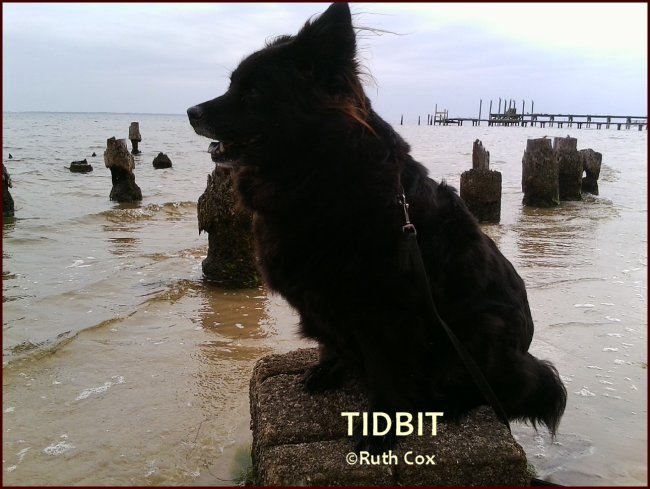 Tidbit and I enjoyed every chance we had to walk the beach a block from our home. However, we learned the lesson well that the sun can bake a beachcomber right into a heat stroke! During the hottest days of summer we planned our walks in time for sunrise or sunset, the cooler parts of the day. And, oft times the most picturesque, I must say. Even when just hanging around the house we need to take steps to keep our dogs cool. Plan outdoor activity around cool spots for the dog as well as for yourself. Here you see, I pick time and place where my dog can lay in the shade instead of in the sunny spots on deck. 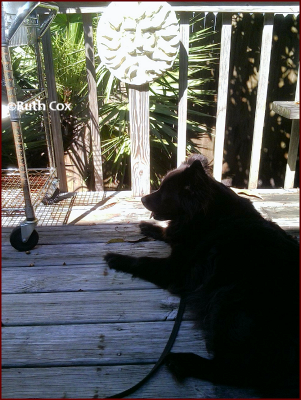 Tidbit and I spent a lot of time in the evenings out on the deck--me reading and she guarding the deck steps from intruders--we protected each other! 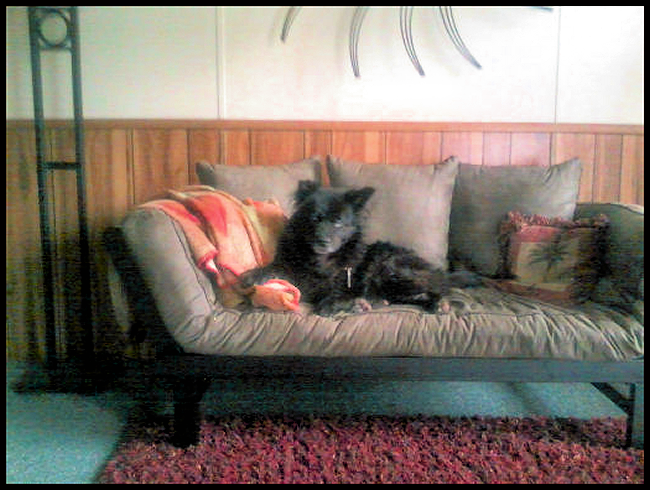 Sometimes it is best for a dog to stay in the cool comfort of home! Our potty walks were short and sweet, out the door and right back in! Tidbit had a couple of yard spots that met with her approval for doing her business. When we cooped ourselves up inside, Tidbit was content to lay on “her” sofa, watching over me on the computer through the cutouts in the wall. Yes, we were both happy to be work at home women. 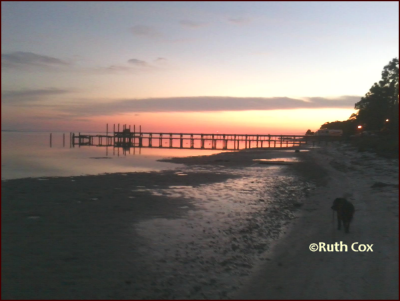 Here I captured the sunrise while walking with Tidbit on the beach here in north Florida. It was around 70 degrees already. Can you imagine how hot that sun was at high noon? It became a sultry 87 degrees! Precisely why we try to plan our beach walks in the coolness of the morning. If a dog exhibits these signs of distress, it's a sure sign the dog needs professional help: Collapse, lethargy, heavy and rapid panting, hot-to-the-touch body, excessive drooling, anxiety, unresponsive to commands or attention, or redness around eyes, gums, or skin. If you think your dog may be suffering heat stroke, get help! You need to immediately cool the dog down, while contacting your veterinarian. The well known saying "An ounce of prevention is worth a pound of cure." is actually from The Philadelphia's Union Fire Company, organized by, and the statement was made by, Benjamin Franklin. This cautionary quote certainly applies to that great ball of fire in the sky and its effect on our canine friends! How do you protect the dogs who love you from the hot dog days of summer? 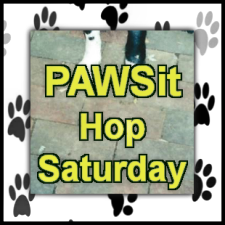 Share your summer day dog story on a blog post of your own and link up with us this week for PAWSIT Hop Saturday! You can submit your blog links any time throughout the week.